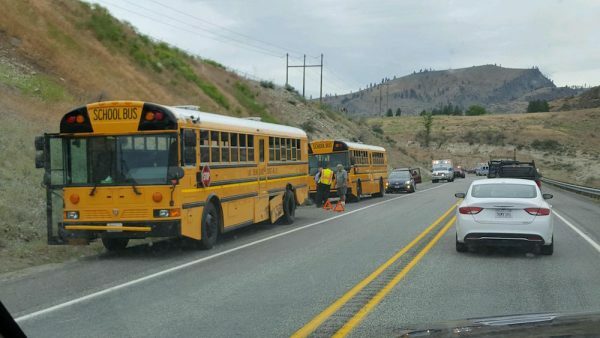 Six children were transported to a Chelan area hospital yesterday after a driver slammed into the bus they were riding in. Brian Moore of the Washington State Patrol told reporters, “The extent of injuries was very minor, just some shoulder and some neck pain.” Approximately 50 children were checked at the scene for injuries by emergency responders. The driver of the vehicle that struck the bus has been identified as 21-year-old Kayla Jones. Before the crash, her vehicle crossed the center line, heading for the school bus in the oncoming lane; Trooper Moore said, “The bus (driver) did an amazing job veering to the right to avoid a head-on collision.” Police arrested Jones on suspicion of DUI. Recent accidents, including one that injured more than 20 children in Renton, have raised concerns statewide about the safety of Washington state’s school buses. The state does not currently require school districts to equip their buses with seat belts or to purchase new buses with seat belts or harnesses. A study begun this year is expected to deliver data on the costs and potential effectiveness of a retrofit program by mid-October. Detractors argue that retrofitting school buses would be a costly proposition in cash-strapped districts that are already struggling to meet minimum education standards. Safety advocates argue that there are potential downsides to equipping all buses with lap belts or harnesses. Bus drivers have expressed concerns about the difficulty of getting children off the bus quickly in an emergency such as a fire. They have also detailed the difficulty of supervising a bus full of students while also driving the bus; unsupervised young students may hurt themselves by using the belts improperly, while older students may play with the belts and use the heavy buckles as weapons. Many districts do not provide school bus aids, making it extremely difficult for drivers to supervise and discipline dozens of students. If your child has been injured in a school bus accident, it may be time to speak with a personal injury attorney about your child’s legal rights.